Parwen is a Bosmer archer who resides in the Skingrad Fighters Guild. Like her fellow guildmates, she has a thing against goblins and spends most of the day training in preparation for eventual confrontations with them. 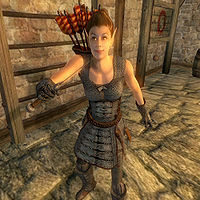 She gets up at 6am and goes down to the Guild basement's shooting range, where she hones her bow skills for four hours. After that, she enters the upstairs area and wanders around there until lunchtime at noon. At 2pm she goes back down to the basement, this time to test her dagger skills by sparring with fellow Guild member Ah-Malz. At 6pm, she returns to the dining area for six hours of eating before finally going to bed at midnight (see bug). Parwen sports an almost complete suit of chainmail armor: boots, cuirass, gauntlets, and greaves. She wields a steel bow with a number of steel arrows and an iron dagger. At night, she sleeps in regular coarse linens and a dark green shirt. She carries a small amount of gold. When approached, she will introduce herself and give you her personal take on goblins: "I'm Parwen of the Fighters Guild. I'm not a great archer, but I seem to have a knack for teaching. And I've bagged my share of goblins. ", and "Actually, underground goblin lairs are no more common here in the West Weald than anywhere else in Cyrodiil." If you ask her about Goblin Hunting, she will share a few tricks on how to deal with them: "My advice is to close quick with the skirmishers... the petty spellcasters... but the shamans are real trouble. Shamans have wicked magics... drains, paralyze... bad stuff. Stand off and shoot or spell shamans down if you can." Her thing for goblins hasn't gone unnoticed, as the townsfolk say: "Parwen has really got a thing for goblins. I think she and Ah-Malz keep a running tally of who has killed more. ", "Parwen is another one of those goblin hunters at the Fighters Guild. She's always talking about her "goblin killing tactics."" and "If Parwen wants to spend all day hunting goblins, I think it's great. Those things are a menace." Parwen's dinner is supposed to last just two hours but as she lacks a default AI package, there is nothing for her to do at 8pm, so she keeps eating. Esta página foi modificada pela última vez à(s) 19h07min de 27 de agosto de 2015.